Conveniently located in the heart of the Midwest in Indianapolis, Indiana, we offer a place set apart from the distractions of the outside world-13 acres of serenity in the city. Experience the comfort and Christian hospitality that is Our Lady of Fatima Retreat House! In the quiet of the woods, the contemplative walk of the labyrinth, the serenity of the Rosary Walk & Prayer Garden, the solitude of your room, or the peacefulness of the chapel, you can discover the gift of God's presence in the stillness of your heart. Would you like to consider Fatima to host your group event? For more information on our facility, click here. For more information on what Fatima can offer your group, call Tim Rathz at (317) 545-7681, extension 115. Come, rest in God and be renewed in the Holy Spirit! Shop Our Bookstore and Gift Shop! Books, gifts, cards, treasures and more!! We appreciate your	prayerful consideration of supporting the ministry of Fatima. WE ASK FOR YOUR SUPPORT! Our Lady of Fatima Retreat House offers many programs and opens her doors to all who want to rest in God and be renewed in the Spirit. We ask for your prayer support, that we may continue to be a quiet and sacred place for all seekers; for your financial support, that we may continue to maintain our beautiful grounds and places for solitude and prayer; and for your volunteer support without which we could not operate and maintain our facilities, serve large groups of guests, and help facilitate our programs. 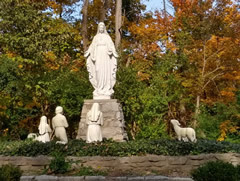 Please pray about how God may be calling you to support Our Lady of Fatima Retreat House. Marriage Preparation: Fatima hosts the Tobit Marriage Preparation program. Details can be found by visiting our Tobit program page. Don't miss out on Our Lady of Fatima Retreat House news and information by e-mail. By clicking here you can sign up for monthly updates on what is happening at Fatima. New inventory is here! We offer a great new selection of gift cards, books, music CD's, sacramental gifts, gifts for the home and much more. Come and see what is available any time our office is open, most days from 8:00 am until 3:45 pm and often until 6:30 pm. Call us to confirm hours. (317) 545-7681. The gift shop is a wonderful place to keep in mind as you are shopping for the sacramental moments in life! We have truly unique and special items for First Holy Communion, Weddings, Confirmation, Ordination, and much more! We offer a wonderful variety of books, music CD's and beautiful rosaries, medals, statues, and other gifts for that special person in your life. We accept cash and checks as well as VISA, MasterCard & Discover. Gift cards are now available! Purchase a gift card in any dollar amount good toward any bookstore/gift shop purchase. Fr. Jim Farrell's Pathways to Prayer Guided Meditation CD's. Click here to find out how all 4 volumes of these CD's can enhance your own prayer life or to share the gift of prayer with others in a unique way. They make a wonderful resource for a parish library as well as a thoughtful gift at any time! Opportunities for silent reflection and conversation with God! To learn about the one day each month we provide for silent self-guided days as well as opportunities for silent directed retreats, Visit our silent retreats page. Spiritual Direction is available upon request for an additional suggested donation. Our Lady of Fatima Catholic Retreat House welcomes people of all faiths to come away and rest in God. We offer hospitality, a peaceful setting with a supportive environment for reflection, and programs for spiritual renewal. Click here to learn about Fr. Farrell's "Pathways to Prayer" CDs!